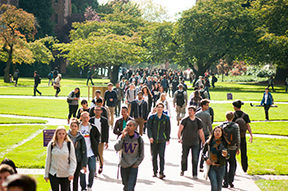 As the intellectual core of the University of Washington, the College of Arts and Sciences discovers, preserves and transmits fundamental knowledge in the arts, humanities, natural and social sciences. Discovery lies at the heart of our enterprise. Our faculty, with the active participation of our graduate and undergraduate students, continuously expand the frontiers of knowledge through research, scholarly interpretation and creative production. The College provides a liberal arts education in a research university with rich opportunities to explore our cultural and natural worlds. Our students learn to think rationally, creatively and critically; to communicate clearly, correctly, and persuasively; to gather and interpret data; and to engage the arguments of others with understanding and respect. These skills and intellectual attributes form the foundation for a lifetime of learning and a thriving democracy. The College plays a vital role in the cultural, economic and public life of local, national and international communities. We prepare our students to become leaders in an increasingly diverse society.